If you're interested in this sort of thing, then you should get a copy of Doug Hinman's book All Day And All Of The Night (Amazon.com link). 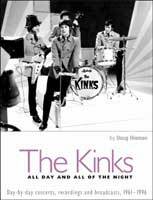 Although it doesn't have set lists for every concert, it does have the most complete concert, recordings and TV/radio appearance history of the Kinks available. Want to add a setlist or make a comment on a particular concert? Use this form.